Cozy & comfortable, this single-story, pet friendly home is just steps away from the beach via direct boardwalk. Located at the end of a quiet neighborhood cul-de-sac, you will enjoy your privacy lounging on the outdoor front & rear sun decks. 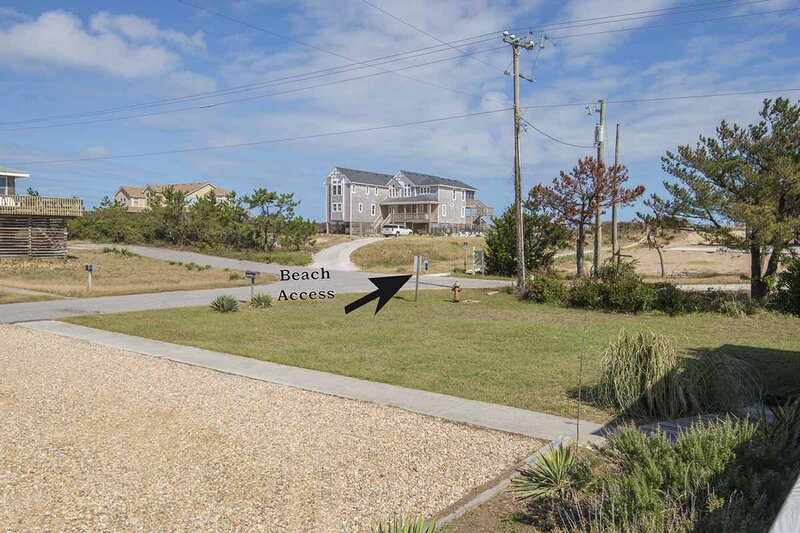 There is a paved barbecue patio w/charcoal grill & picnic table; the place for cooking up a casual beach-side dinner! The outside shower is perfect for rinsing off sandy feet (and your pet) after visiting the beach. If you decide to venture out, historic sites, attractions, shops, grocery stores, & restaurants are close by in the towns of Southern Shores, Duck, & Kitty Hawk. Ground Level: Parking for 2 Cars, Steps & Ramp to Covered Entry, Outside Shower, & Park Grill. Main Level: Living/Dining/Kitchen Area, TV, DVD, Rec. Room w/Foosball Table, 3 Bedrooms (1 Master Suite w/Queen, TV & Full Bath, 1 w/Queen, 1 w/Duo Bunk), Full Hall Bath, Large Laundry/Mud Room, & Sun Decks w/Deck Furniture. Features include: C/AC & Heat, Washer/Dryer, Dishwasher, Microwave, 3 TVs, DVD, Stereo w/CD, Wireless Internet, Sun Decks, Deck Furniture, Charcoal Grill. Member of the Southern Shores Civic Association (SSCA) which provides you w/No Fee Access to 4 Miles of Southern Shores Beaches w/Parking, Boat Launching Area, 3 Soundside Marinas, Soundside Bathing, Beach, & Picnic Area, Sea Oats Park/Play Ground, & Walking/Biking Trails, & Member SSCA Tennis Club. One Dog (No Exceptions), Allowed w/Fee. This is a Non-Smoking Unit.